In America, “salad” has come to mean a mixture of lettuce and possibly some other raw vegetables, generally including tomato for color, regardless of the seasonality or flavor. But that’s not the origin of the word. The word comes from the Latin salata, short for herba salata, salted vegetables, a popular Roman dish. The vegetables were seasoned with brine; vegetables that sat in salted water for an hour or more become pickled vegetables. Appetizer salads, a light starter served as the first course of the meal. 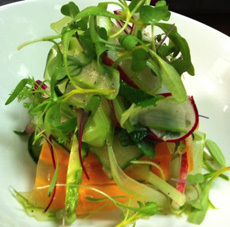 Microgreens, radishes and aspic with carrots. Photo courtesy Silk Rd Tavern. Side salads that accompany the main course. These can be based on raw or cooked vegetables or on beans, grains, pasta, potatoes, rice, etc. Main course salads, usually containing a protein, such as grilled beef, chicken breast, duck, salmon or seafood, or hard-cooked eggs (served with bacon in a traditional spinach salad). Dessert salads, such as fruit salad or gelatin containing fruit. According to Health.gov, teen and adult women should have four servings of vegetables per day; teen and adult men should have five servings. If you’re weary of lettuce salads, try making salad without the familiar bibb, Boston, chicory, iceberg and romaine lettuces. Instead, use arugula, baby spinach, carrots, celeriac (celery root), celery, cucumber, endive, fennel, green beans, microgreens, mushrooms, mustard greens, radicchio, radishes, sprouts, summer squash, watercress and things you come across in the produce section that you haven’t tried before in a salad. Integrate some color: beets, carrots, cherry tomatoes. You can still use favorite garnishes: croutons, herbs, nuts, seeds. If you like to have fun with gelatin, make an aspic with vegetables as shown in the photo, and serve it with salad on the side or on top. You already know this, but fatty dressings based on mayonnaise, sour cream. Stick with vinaigrettes made with a heart healthy oil (avocado, canola/rapeseed, flaxseed, olive, sesame, walnut). Find more of our favorite salads and recipes.